They detailed their sightings, and saw no reason to ridicule those who did so. Documents from the Middle Ages show more recorded UFO sightings than in all of NASA’s top secret files. Why so many medieval sightings? Well, according to historians, medievals could report their sightings without fear of being branded a nut cake. And according to space scientists, UFO’s had nothing to fear from the medievals. There was no technology, as we have today, for launching attacks on flying foreign objects. UFO’s could fly openly across medieval skies without a worry. Or like a bunch of medieval hooey? Well, before you sprain an optical muscle rolling your eyes (because when it comes to UFOs, eye rolls get seriously intense), consider this documented account. Once dismissed as Middle Ages hooey, the Nuremberg UFO incident (German narration here) is now considered highly plausible by an increasing number of modern day space scientists and historians, as well as archaeologists and geologists who have unearthed inexplicable evidence in the area of the Nuremberg incident. Dim rays of dawn reveal a “very frightful spectacle” in the skies above the city. People pour from homes, storefronts…every building empties human occupants into the streets. Heads tilt back, mouths drop open, eyes widen and do not blink. An entire city mesmerized by hundreds of metallic objects battling across the skies. 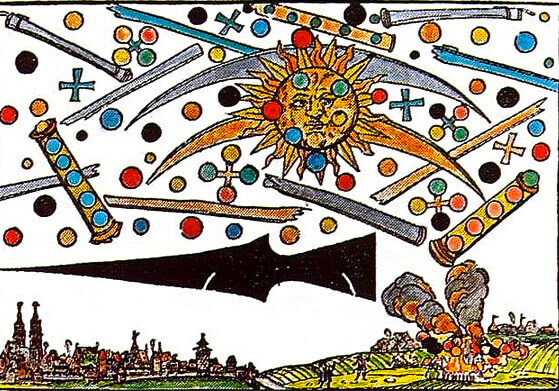 Actual 1561 artist depiction by medieval witness to Nuremberg UFO incident. 1561 Nuremberg, Germany news broadsheet detailing the UFO incident. Witnesses of the event also describe how smaller shapes began flying out of the larger shapes, shooting rays of light which caused other shapes to disappear or fall from the sky. Now, remember. Medievals had no knowledge of UFOs, as we do today. Moreover, they had no knowledge of flying things which could be mistaken for UFOs – like airplanes, blimpies, weather balloons, or any other airborne technology. It was exactly this lack of reference point which caused them to believe they had witnessed an act of God. What may look to us, in the 21st century, like a round disc with multicolored lights beneath it, or an airplane with red lights on the wings, would have looked like the shape of a cross to medievals. But airplanes had not been invented yet. And flight itself as a believable concept was centuries away. What did those medievals see that day?? In the wake of the Nuremberg incident, further widely distributed medieval broadsheets warned people to beg forgiveness for their sins. As in every era, including our own, such inexplicable events were attributed to God. What do you think Nuremberg medievals saw that day? What say you about the existence of medieval aliens?